I had an opportunity to visit the ‘Parks and Recreation’ set on Friday. I visited a location shoot in the morning, and then hung out in the studio for the rest of the day, alternating between watching them shoot Episode #4 scenes on the first floor, and hanging out with the writers on the third floor. They even cleared off a desk for me so I could use my laptop throughout the day! In any case, here are my random notes and photos from the day. Thank you Greg and Mike! 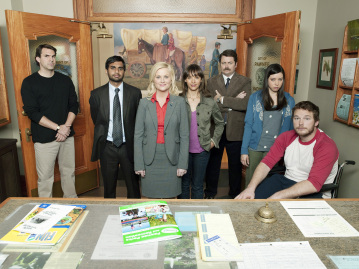 And remember to watch the ‘Parks and Recreation’ series premiere tonight, in between two new episodes of ‘The Office’!